First-generation stream processors, such as Apache Storm, wanted us to write code. It was a great start. However, when building real-world apps, which are used for a long time and evolve, writing code gets us into trouble. If we want to query a database or query data stored in storage with Hadoop, we use SQL. Why can't we query data streaming using SQL? We can. Almost all open source stream processors, including Storm, Flink, and Kafka, have switched to SQL. 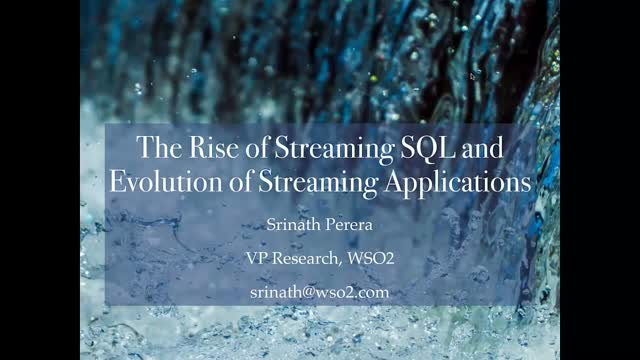 In this webinar, Srinath will talk about the evolution of stream processing, streaming SQL, the status quo, and what this means to stream applications. He will also dissect the experience of building streaming applications by exploring common patterns and pitfalls.